Hey there, lovely folks! Sorry for the lack of posts last week. I have been spending all of my time getting my half bathroom together, and I kinda just let the week pass me by! My apologies. 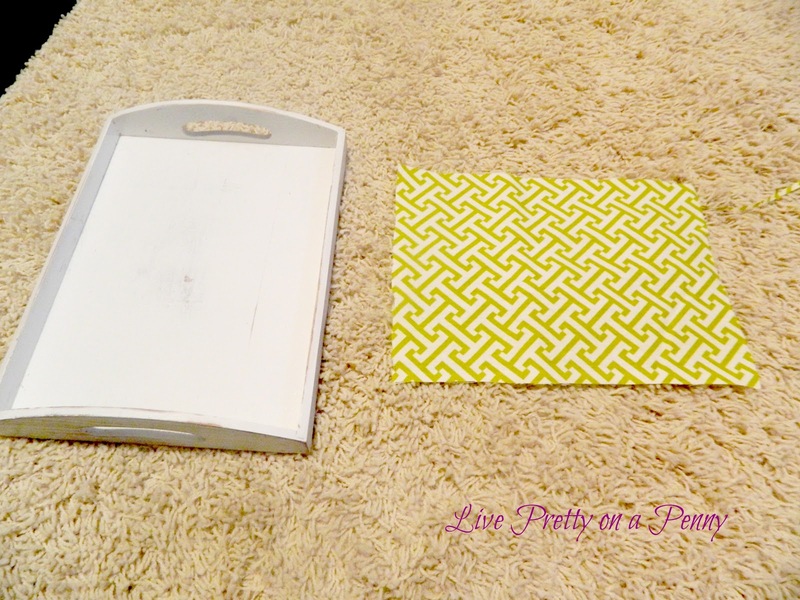 I am back with a cute, easy, fun, and cheapo ahem, inexpensive project guaranteed to add a little pizazz to any kitchen counter, or any tabletop that you choose! 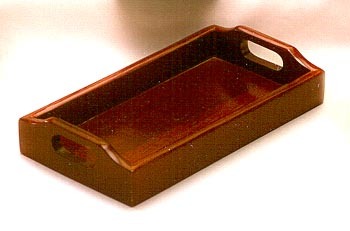 I had a basic wooden tray that looked something like this. I purchased it from Goodwill for $1.25. Yep, you guessed, I forgot to take a before photo (bad DIY blogger…I know). I didn’t know what I wanted to do with it, but just knew it was cute. So this past Friday, I decided to breathe life into this little thrift store treasure, and here is how I did it. I first took my tray and spray painted it white. I used Valspar gloss white spray paint , sold at Lowe’s. Wait, let me have my Tom Cruise moment and yell, “I LOVE this spray paint!” It is by far the best that I have ever used, considering the fact that I don’t have the greatest luck with spray paint:( This one does not drip, goes on light, and allows you to build the coverage (no Valspar did not pay me to say all this:), but it’s true! 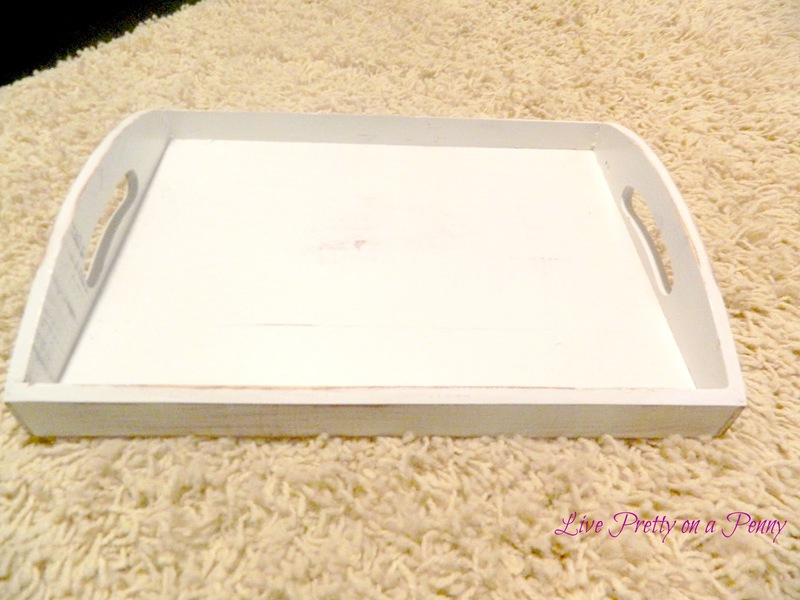 Once my tray dried, I lightly sanded it to create a “distressed” look, and when I finished it looked like this. Then I used a piece of leftover fabric from another project and cut it out to fit the inside of my tray. What’s so great about this project is that you can use any type of fabric of your choice. 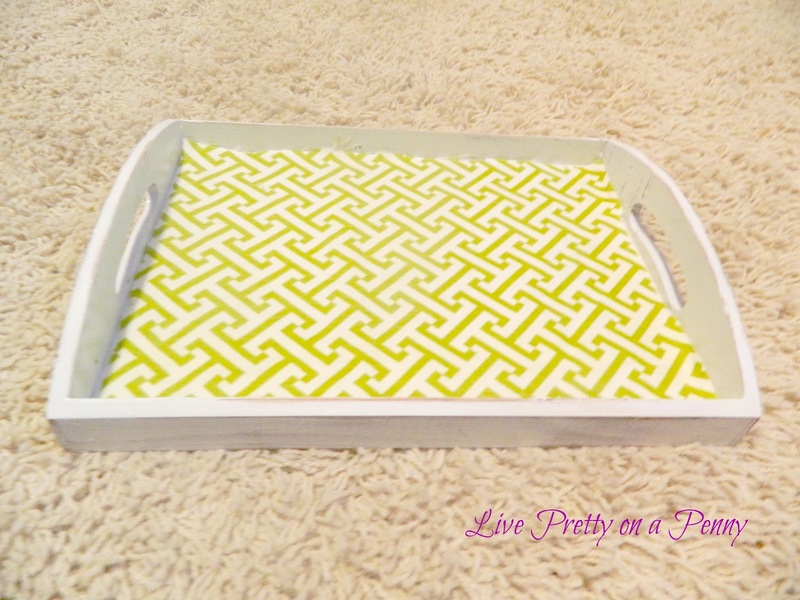 Next, I drizzled hot glue inside of my tray, and stuck the fabric on top. And voila!! My new little future kitchen accessory. 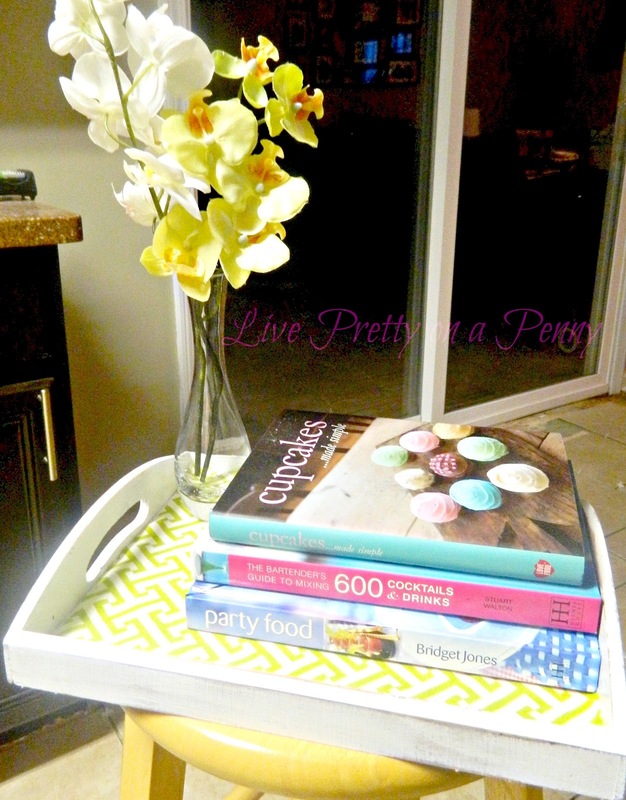 I decided to use it as a holder for my cookbooks:) You can disregard the mess in the back. We are in the process of getting new floors laid, and a few other kitchen reno’s so my little kitchen tray has not been “officially” placed yet. I hope that you enjoyed this fun little project. Let me know what you think! Have you done any quick, easy, and thrifty projects recently? Do share! Next Post Cheers to the Weekend!